This lovely triptych edition of the Sefer Night series reflects the cusp of midnight, a time when celestial forces draw us to sleep. The deep power of surrender to the night reveals the great mystery of our lives and the infinite potential of the most profound commitments. Designed as a charming miniature triptych composition this intimate rendering can find a nook in any home and creates a mystical aura without demanding attention. 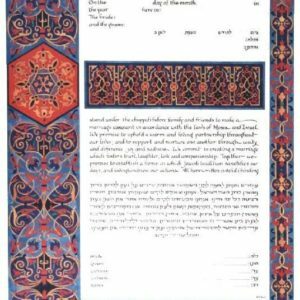 For anyone with an eye for excellence in miniature art this lovely ketubah design also suits a modest budget. 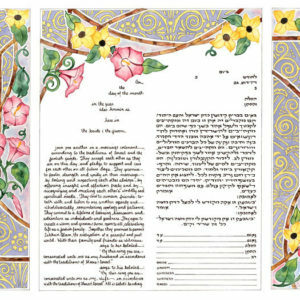 This lovely triptych edition of the Sefer Day series reflects the moment of completion of the rising of the day. This composition parallels the life cycle ceremony of the marriage covenant, at once an act of completion and continuance bound by the moment of transition of the zenith phase of the rising of the sun. Designed as a charming miniature triptych composition this intimate rendering can find a nook in any home and creates a joyous aura without demanding attention. 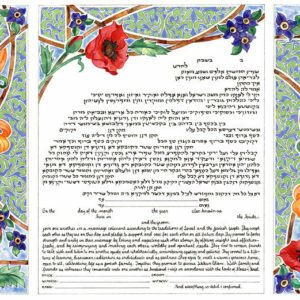 For anyone with an eye for excellence in miniature art this lovely ketubah design also suits a modest budget. 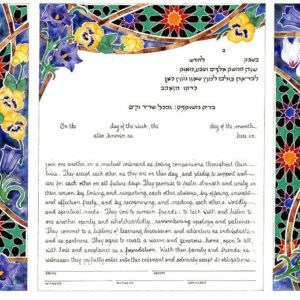 This lovely triptych edition of the Sefer Dawn series reflects the dawning of each day. With tender openness we awaken to the blessing of the marriage covenant and the gentle loving-kindness which is embraced by the dawn hours. Designed as a charming miniature triptych composition this intimate rendering can find a nook in any home and creates a delicate aura without demanding attention. For anyone with an eye for excellence in miniature art this lovely design also suits a modest budget. The designs of these illuminated pages are derived from 15th century English and Italian Renaissance ornament. These lively and free form renderings are delightful reminders of the rich and varied decorative ornament created in 14th and 15th century Europe. Accompanied by thoughtful, contemporary Wedding and Anniversary vows, these miniatures are original 20th century artistic creations that will be enjoyed for generations.